1. Don't do it alone. 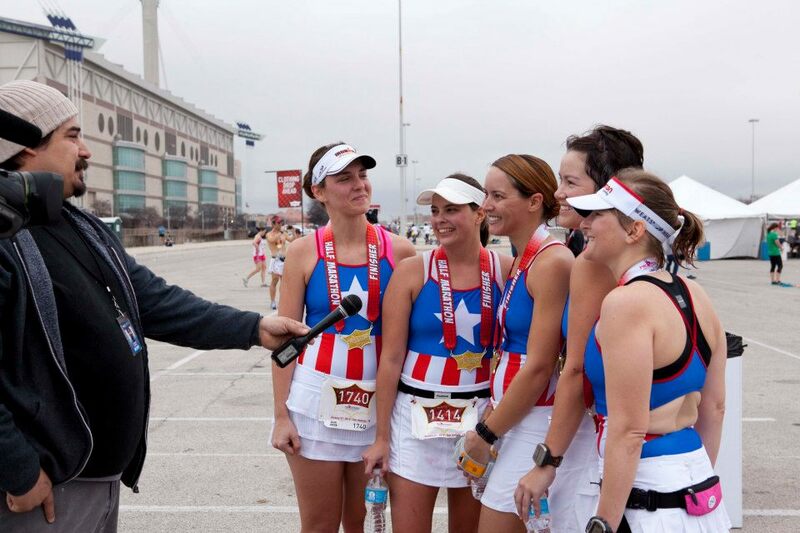 A month before the race, get a few of your closest friends together and talk them into running "just for fun." Then tell anyone who knows you're racing that you were peer pressured into it, and that you don't have any high expectations. Hey, we're not runners. We're triathletes. 2. Make some good excuses in case you don't nail it. We're "training through it." This isn't our "A" race. 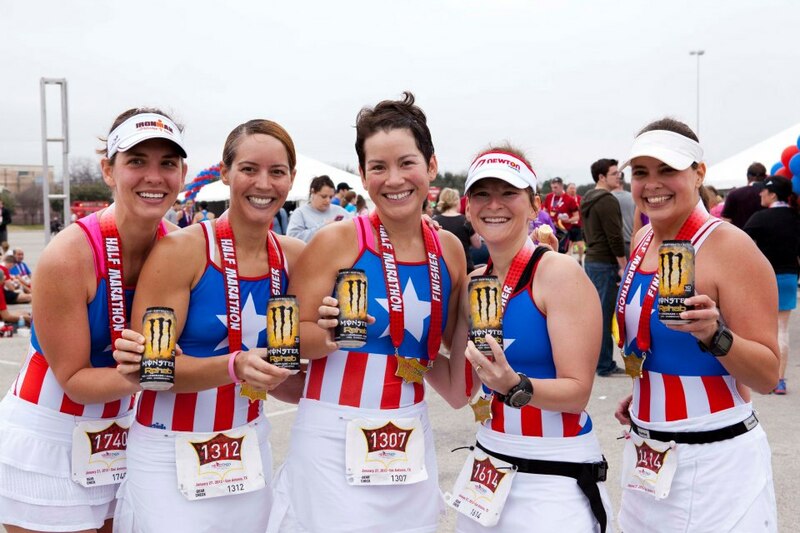 That's Ironman Texas in May. Hey, did I mention that I'm training for an Ironman? Yeah, we crushed 80 miles on the bike yesterday. This is just a training run for us. No big deal. We do this every Sunday. Because we're training for an Ironman. 3. Dress to impress. 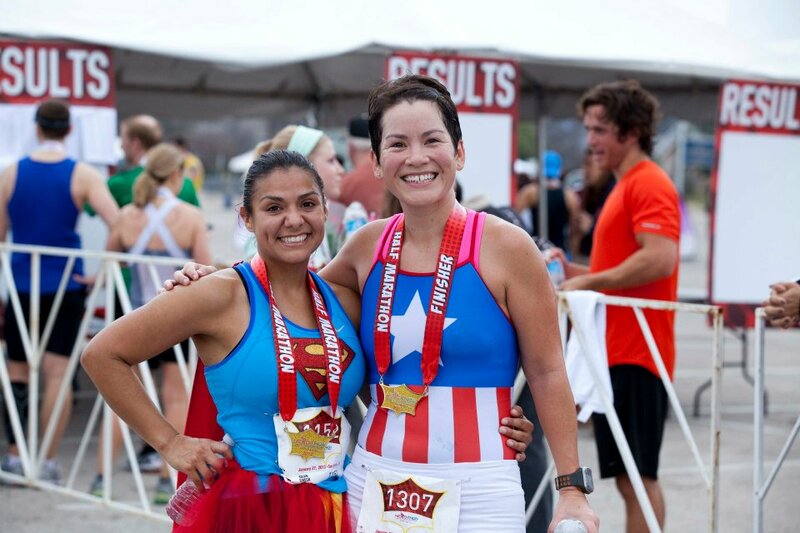 Choose a race that welcomes costumes, like the Herothon. Nobody will take you seriously if you're wearing a silly costume. Additionally, it might get you a segment on the news (Fox and the Spanish channel), or a chance at being a Monster drink model. 4. 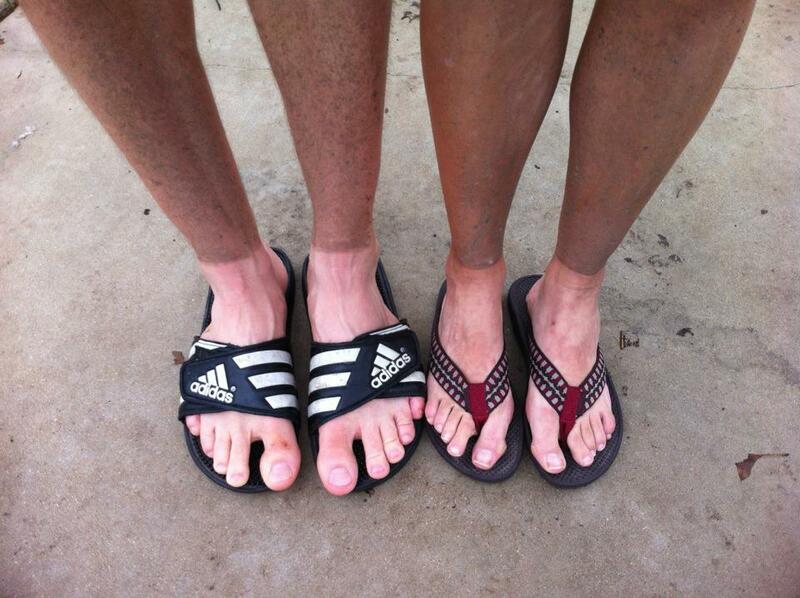 Choose a race that's guaranteed to have good running weather. What, it's January and unseasonably warm and humid? Well, I guess we'll try to do our best anyway. 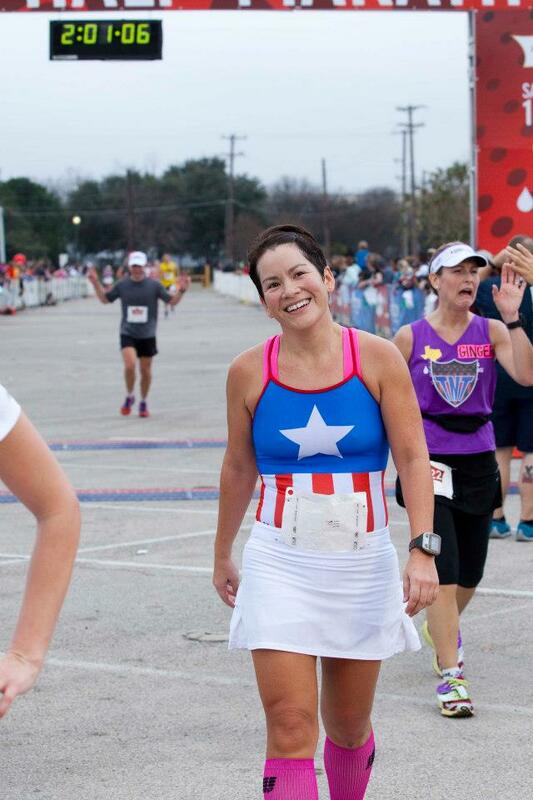 Good thing we decided to wear Captain America swimsuits instead of tights or a musclebound Halloween costume. 5. Run with a faster friend and hold on. Hmm, that was supposed to be the plan. But they dropped me at the start line. So...maybe amend this one to "try to catch your faster friends." Or, you can find another superhero to chase. Supergirl was an awesome rabbit for me. Orissa ran the Endurathon yesterday, a hilly half marathon, and got a PR there. She bested it by 5 minutes today. Outrageous! Shelly is coming off an injury that set her training back for months. She took 15 minutes off her open half marathon time today. Amazing! Aixa matched her super fast half marathon time today after her longest bike ride ever yesterday - 75+ miles and then straight to hospital rounds until 8:30 pm. Rick-diculous! Linda and I both had an awesome training ride yesterday and then PRed at the Herothon today. 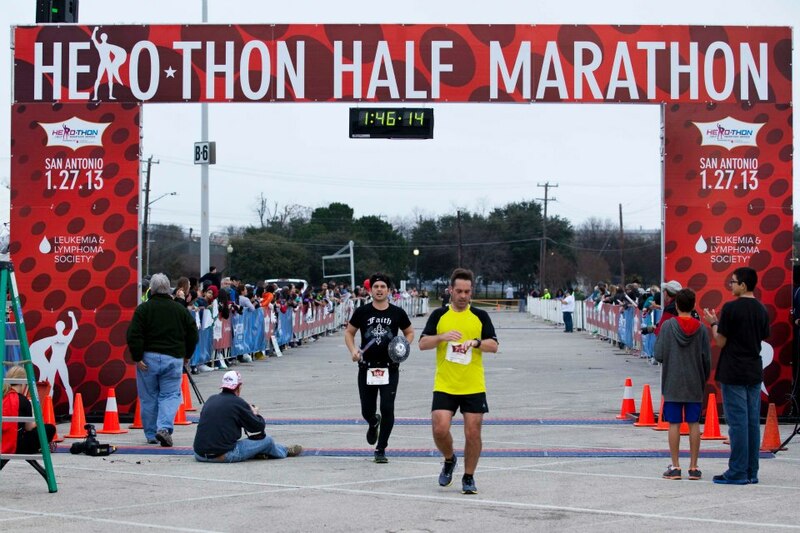 I ran 10 minutes faster than I've ever run at a half marathon before. Yahoo! 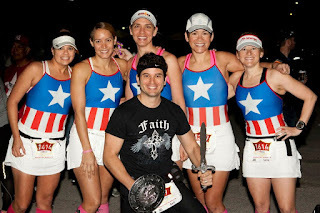 And although he's not an official Iron Whiner, Allen "Super Chi" Alvarez crushed it today while carrying a sword and shield and sporting the headband as always. Awesome! What a way to start the 2013 racing season. Way to go, girls! I couldn't be prouder to be an Iron Whiner! And as always, a huge thank you to our team photographer, Robert; our Coachie, Dawn Elder, who continuously shows us that "anything is possible;" and all our friends (Brian, Jamie, and Lexa, to name a few!) who were out there cheering and supporting us today! After Lance Armstrong "came clean" this week to Oprah, lots of people have asked my opinion on the topic, I guess because I ride a bike and therefore might have an interesting opinion. I don't know how interesting my opinion is, but because this is my blog, I'm going to put it here for you to read if you want to. I was glued to the TV on Thursday night. I'm disappointed, even though I feel like we didn't learn anything we didn't already know. I'm embarrassed that Robert and I made a big deal out of taking Andre up to Mellow Johnny's in Austin to show him Lance's bike shop and all the yellow jerseys. I feel bad that my Dad, who went to France to watch the tour, who handed out yellow bracelets to everyone he knows, who loudly defended Lance pretty much to the end, was joking about wearing his Mellow Johnny's bike gloves while picking up garbage on an Adopt-A-Highway outing this weekend. But the thing that stood out the most to me was when Lance commented that he thought that out of 200 guys on the tour, maybe 5 guys were racing clean and that they were the real heroes. Over a couple of long workouts this weekend, I had some time to think about that. 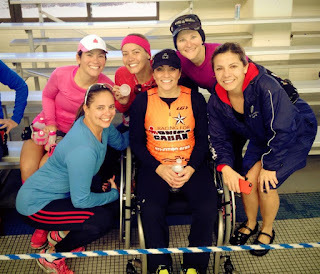 My little group of workout buddies are all in the same general range of ability that we can keep up with each other and still push ourselves to improve. As we were fighting the wind in the last 25 miles of our ride on Saturday and Brian was riding away from me up a hill, I got discouraged for a little bit and then thought NO! I'm going to fight! Because fighting the wind and the hill and trying to catch Brian are what will make me a stronger cyclist. I know I won't catch him today...but maybe one day I will. Now, chasing Brian on the bike is one thing, because I'm confident on the bike and I know that any work I put in will make me better, stronger, faster. The run is an entirely different animal. On a group run with the girls, I'm not thinking "oh, adversity will make me stronger." I'm praying, "please, please don't let them pull too far away from me because I'll never catch up." I know I need to fight a little harder just to stay with their "regular" pace. And when they put on the gas...forget it! Even when I have the greatest run splits of my life, I'm thinking, "I couldn't catch Aixa." I can say that maybe one day I will, and I believe it! But...what if I could never humanly catch Aixa? Back to the guys on the tour. I'm guessing that the cyclists who chose not to use performance enhancing drugs knew that "everyone else was doing it." And they knew that they weren't on a level playing field. 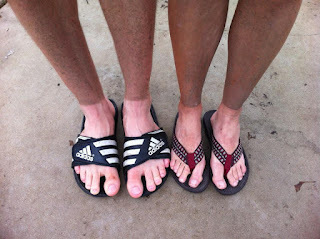 Yet they went out there and trained hard enough to make the teams and race the tour. I'm so curious about what that must feel like. 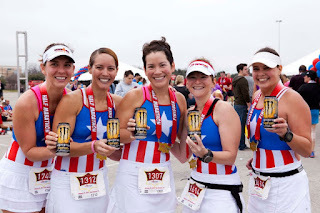 In my world, I go out there to race and I know that there are tons of women in my age group who are faster than me. But I feel like if I train hard enough, I can be fast like them one day. It's being able to believe in that that keeps me going when I struggle. Those guys who didn't dope wouldn't have been able to think that way. I can't imagine training and racing and knowing that no matter what I do, I'll never be as fast as the rest of the people I'm racing against because they've put themselves on a level that I could never legally/morally attain. How do you get out there and do it? Is it just for the love of the sport? I guess I won't ever know and I don't even know who those guys are anyway. I will agree with Lance that they are heroes. And I hope that there are more athletes like them and fewer like him on the tour and in sports in the years to come. Everyone wants to get faster, right? Well I certainly do. Countless (fast!) people have said that the best way to get faster is to ride/run with someone who's faster than you. In trying to keep up with them, you'll get stronger. The issue has been that on the weekends when we work out in groups, we're also doing zone 2 training, so it's really easy to just say "let's keep it easy, it's a zone 2 ride today, people!" And then you end the ride, look at your Garmin, and see that your average heart rate was in zone 1. Blah. Last year, Shelly and I figured out (with Dawn's help) that zone 2 is big. A zone 2 ride or run can happen in the bottom, middle, or top of zone 2. If you're riding or running significantly faster at the top of the zone than at the bottom, you're getting your zone 2 training in, and getting faster. Right? I'm hoping that if I'm wrong here, Coachie is going to read this and step in and correct me. But I watched it work for Shelly last year as she ran to the top of zone 2 and away from our little group on every training run. And now I want it to work for me! Our first build for Ironman Texas started this week, and I made a plan to GO FASTER this weekend. Luckily, Brian was in on this plan and he loves to help people, so he joyfully agreed to be my rabbit and let me chase him on the bike this weekend. Alphanso decided to join us on Saturday's ride, too, so I had not one, but TWO boys to chase! The group arrived at Soler's to find wet roads (no actual rain) and 70 degree temps, and we headed out to Castroville for a 60 mile ride. 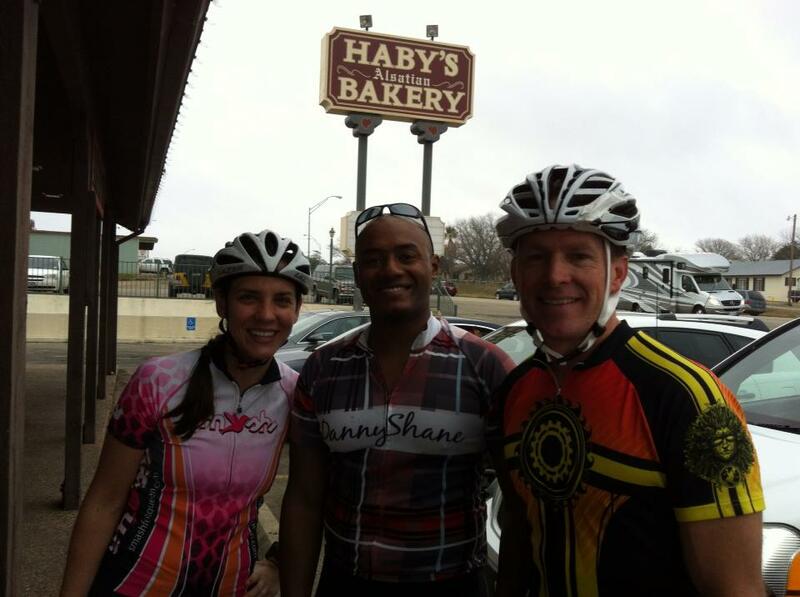 The promise of a Haby's donut in the middle of the ride made us all smile. As did the GoPro camera mounted on the front of Alphanso's bike, although I'm sure it never captured any faces, just butts. We'll see. We rode out easy and then when we got to the gas station at Culebra, we put the gas ON. Shelly jumped on the train too and we rode to Castroville faster than I've ever done before. At the 30 mile turnaround, we had a 19.3 mph average, which is fabulous for me. And Alphanso got his first Haby's donut. I chased Brian back towards town and even though we had one mishap (Shelly hurt her knee and had to be picked up by Orissa, who had finished her ride with Aixa earlier and luckily was able to come and get Shelly), I ended up having one of my fastest rides ever (in zone 2!). A big "thank you!!!!" to Brian and Alphanso for the motivation. Then we all went home and spent hours cleaning our bikes. Here's the before picture of my poor mistreated Slicey. See the caked on mud - argh! I planned to apply the same reasoning to today's 12 mile run and informed Linda that I'd be trying to stay with her. She promised to bring her A game. And she did! Well, actually, I really had to pee (sorry, maybe too much info) so we ran really fast to the nearest gas station (2 miles away). When we got there, Linda said "great pace! Let's try and keep it up for the rest of the run! And also, my watch just ran out of charge, so we'll have to use yours." Now I felt responsible for keeping up the pace and keeping up with Linda so that I could report her times back to her at the end of the run. So that's what I did. It was a GREAT run, although cold and we both suffered chafing from wearing arm warmers with our sleeveless tanks (yes, that's what we get for this fashion no-no, I know). Here's the group, post run. At 40 degrees, it really was ridiculously cold and windy out there today. But what a great weekend for training! Today was another first for me - participating in a swim-only event. Dawn and her Master's swim coach, Susan Ingraham of Masters of South Texas coordinated Monica's Mile, a fundraiser for our friend Monica Caban, who was paralyzed after being hit by a car on her bike last year while training for Ironman Arizona. 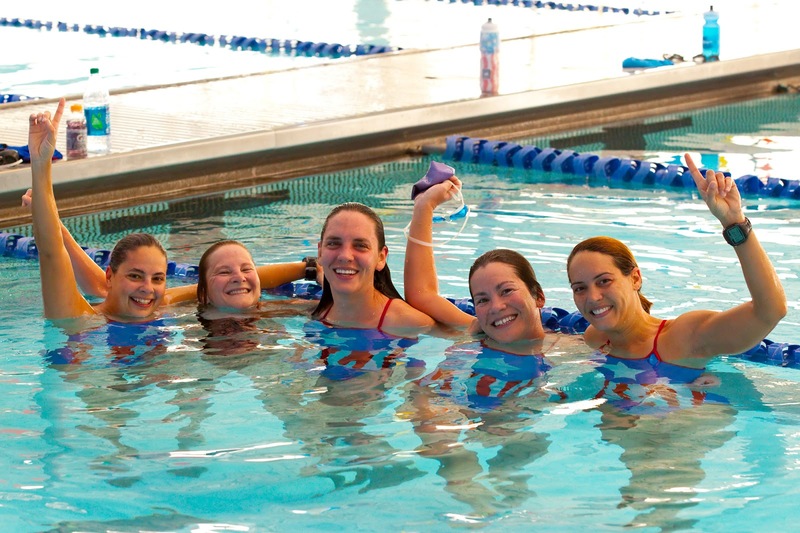 The options for the event were a 1-mile swim or a 1-hour swim. Dawn informed her athletes that we'd all be doing the 1-hour version. This means swimming in a 25-yard pool for an hour while someone counts your laps for you (thank you Patrick!). Sounds awesome, right? Not really. But we would be doing this for a VERY good cause and the girls and I found a way to have some fun - we wore coordinating Captain America swimsuits. Here we are with Coachie in the middle, looking speedy in her swim skin. Shelly and I shared a lane, which happened to be next to Coachie, who, I must say, was a little screamy this morning. "No stopping! Don't stop to drink water! You swim for an hour! You can do this! I'm going to base all your intervals off this time so I want it to be right! Get in the water! Warm up! What are you dooooiiiinnnnnng?!" In her defense, getting all of us to behave may sometimes be like herding cats. But anyway, the 8 am swim start went off without much warning and 32 people in 16 lanes were swimming! As we started, Shelly and I stayed together, perfectly in sync, for the first 12 laps or so. Then I fell back and stayed about half a lane behind her for the rest of the swim. I watched and made sure that she didn't get too far ahead of me, and we settled into a "comfortably hard" pace for the hour. Until the 2-minute warning when everyone on the deck started screaming. At that point, I hustled to catch up with Shelly and we finished the swim together - 3450 yards in 1 hour. 138 laps. I worked that out to be 1:45 per 100 yards, or 1:55 per 100 meters. Not our fastest, but not our slowest pace. But my goodness, was that boring. It's so weird to be bored and out of breath at the same time. I lost count of the laps after about three and after that, it was torture not to know how far we had gone and how long we had left. I kept looking at the lanes around me, watching Coachie and Linda lap me on either side, and watching Aixa and Orissa turn at the ends of their lane, 2 lanes over. There were no buoys to let me know that the swim was almost done. Only a black line at the bottom of the pool. Once we were finished, we were happy happy campers. That's Linda beaming next to Shelly. She swam a thousand yards further than us and that includes stopping to drink (yes, Dawn! She stopped to drink!) and to take off her Captain America suit (she had one under it) because it was too big. She's a real swimmer, and my swim hero. Then, because Coachie loves us, she sent us out to run for an hour and a half. And after several snot-rocket-blowing laps of McAllister Park's trails, we headed back to the pool to cheer the 10:30 group that was finishing, and to give Monica a hug. The coolest moment of the day was when an older lady came up to greet Monica right after we took this photo. She told Monica that Monica had inspired her to swim further in an hour than she'd ever done before - 4500 yards. Now that is speedy. Monica graciously thanked her and I think we all wiped a tear away.